Delhi Capitals (DC) registered their third win on the trot as they defeat Sunrisers Hyderabad (SRH) by 39 runs at the Rajiv Gandhi International Cricket Stadium. The win was Delhi’s fifth in the Indian Premier League 2019 (IPL 2019). On the other hand, it was SRH’s third consecutive defeat. Meanwhile, Delhi now moves to the second spot on the IPL 2019 points table which is dominated by defending champions Chennai Super Kings (CSK). SRH vs DC Highlights IPL 2019 Match: Kagiso Rabada, Chris Morris Hand Delhi Capitals 39-Run Win. It was Kagiso Rabada special that helped Delhi Capitals register an impressive win. The Purple Cap holder scalped four wickets and Sunrisers lost last eight wickets for just 15 runs. With required run-rate creeping up, the batsmen tried to go after the bowling but failed in doing so. 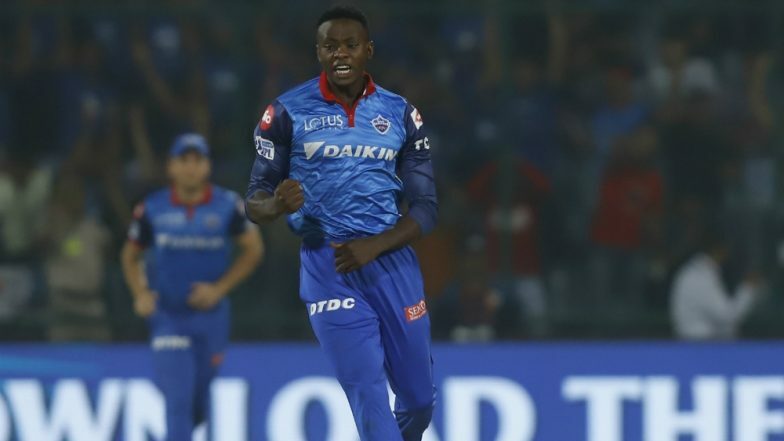 IPL 2019 Purple Cap Winner Updated: DC's Kagiso Rabada Overtakes CSK's Imran Tahir To Bag the Purple Cap in Indian Premier League 12. David Warner and Jonny Bairstow once again put up a solid opening partnership. But rest of the batsmen failed to make any significant contribution. The openers added 72 runs and then SRH lost their way. Bairstow scored 41 off 31 balls and Warner notched 51 0ff 47 balls. IPL 2019 Points Table Updated: DC Moves to Second Spot on the Indian Premier League 12 Team Standings With Win Over SRH. # Playing in his 100th match for SRH, Bhuvneshwar Kumar completed 100 wickets for the team. # David Warner registered his 40th IPL half-century. # Sunrisers lost eight wickets for just 15 runs. Batting first, Delhi Capitals managed to post 155 on board after Shreyas Iyer and Rishabh Pant added valuable 69 runs for the third wicket. Iyer scored 45 off 40 balls while Pant chipped in with 23 off 19 balls. Apart from them, Colin Munro, who replaced Colin Ingram in the playing XI, made a valuable contribution of 40 runs off 24 balls.